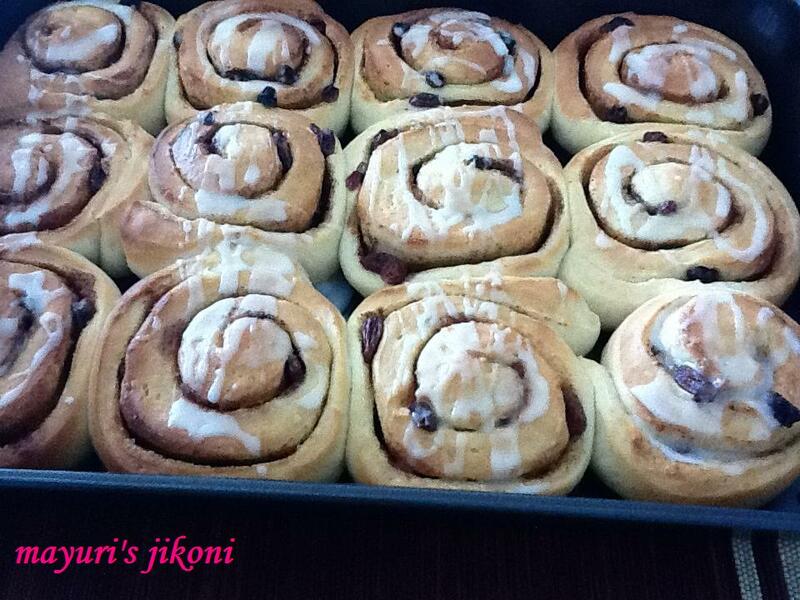 Cinnamon rolls or Chelsea buns are my favourite. I love having them with a glass of cold milk. The best way to have the rolls is to unwind the roll as you go along. Sweet and full of cinnamon, I love the smell while they are baking. I store the leftovers in an airtight container, though they do become a bit soft. Place it under a medium grill or in the microwave to warm it up again. When the kids were young, it use to be their favourite tea time snack. Sift the flour. Add sugar and salt and mix lightly. Add yeast,warm milk and vanilla extract. Dust the work top with flour and knead the dough for 10 minutes till it becomes smooth and silky. Or use a dough kneading machine. Grease a big bowl with oil or butter. Shape the dough into a big ball. Place the dough in the bowl. Cover it with a cling film and leave it in a warm place for nearly 2 hours or till the dough becomes double the size. Keep the filling ready by mixing the raisins, sugar and cinnamon powder together. Gently knead the dough using oiled hands. Let it rest for 10 minutes, covered. Using flour, roll the dough into a rectangle of 12″x 16″. Leaving an inch border on both long sides, spread the soft butter over the rectangle. Sprinkle the filling all over. Brush water on the borders and roll it up like a swiss roll. Try and roll it up tight. Cut the roll into 12 pieces. Grease the baking pan with butter and place the cut rolls into it. Push in any of the raisins that may have popped up.Cover the pan with a cling film. Let the rolls rise for about 35 to 45 minutes. Bake the rolls for about 25 to 30 minutes till they become golden brown on top. In the meantime prepare the glazing and keep it ready. Sift the icing sugar in a bowl. Add the milk, melted butter and orange rind and mix well. Remove the rolls from the oven. Leave it in the pan for 5 minutes. Drizzle the glazing over the rolls. Remove the rolls from the pan and let it cool on a wire rack. Serve with butter, tea, coffee or a glass of cold milk. Add nuts to filling if you like. I usually like to brush the cut rolls with milk before allowing them to prove again. Add raisins and chocolate chips if you like. If you are no using instant yeast then let sprinkle the yeast over ½ cup warm milk. Add a tsp of sugar and let it ferment for 5 to 10 minutes. Add to the flour with the rest of the milk to form a dough.